Posted 3 years ago on Friday, May 27th, 2016 by James S.
My wife needed a way to organize her thread spools, but the organizers available all looked to be cheap plastic and/or fairly expensive. I simply couldn’t bring myself to plunk down $45 for a plastic box. 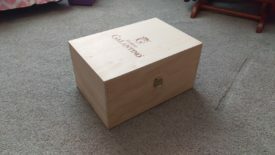 Instead of doing that, I made some quick modifications to a nice wooden box that some wine had shipped in. The result is a nice sturdy spool holder that cost less than $10. 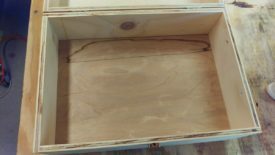 If I hadn’t had the wine box handy, I could have simply made a box out of plywood. I had saved this box because I liked the box joints that were used to make it and figured it would be useful for something later. I grabbed one of my wife’s thread spools to use as reference for spacing and dowel rod diameter. My design is pretty simple: I just put holes in two boards, put lengths of dowel rods in them, and put the whole thing in the box. A 3/8″ rod fit well inside the thread spools with a bit of slack. 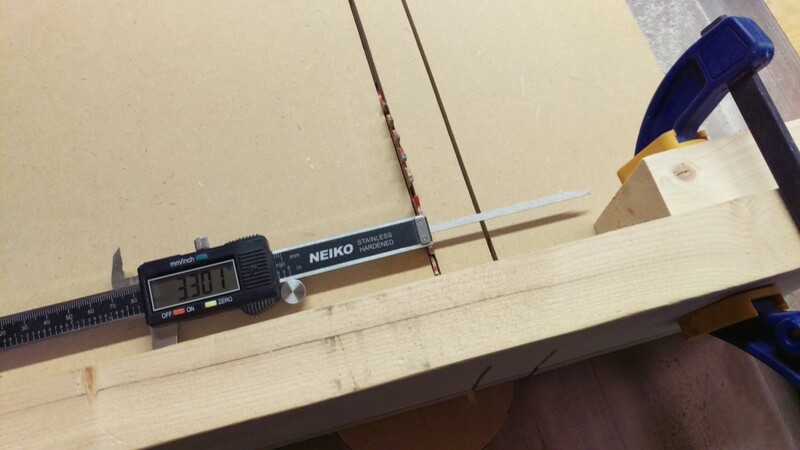 Now, dowel rods from home depot are generally horrible. They’re rarely round and rarely 3/8″. In the past, such as my crib build, I’ve had real issues with them. That said, in this instance, they’re close enough and very cheap. Since there was a bit of slack, it didn’t matter that they were out of round slightly. 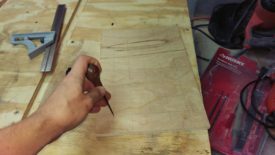 I needed some wood for the boards. Unfortunately, I had used up all my decent-looking plywood scrap. I ended up cheaping out and getting a $5 piece of underlayment from home depot. 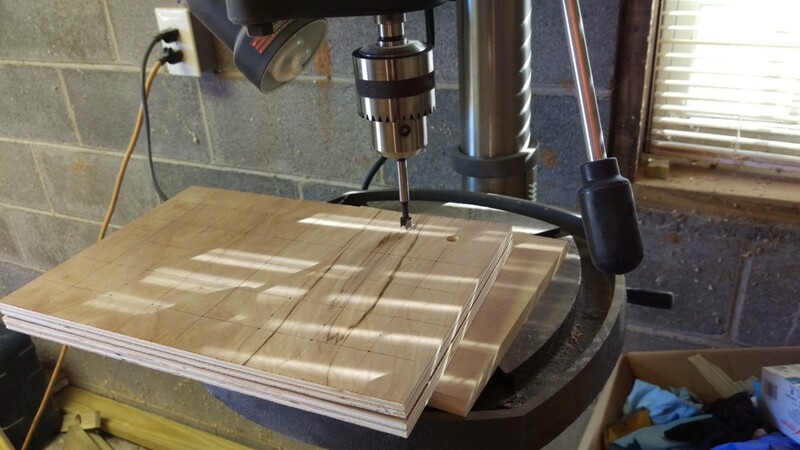 In retrospect, I should have paid a little more for better wood: the underlayment looked OK, but I had to be really careful about tearout when drilling holes. 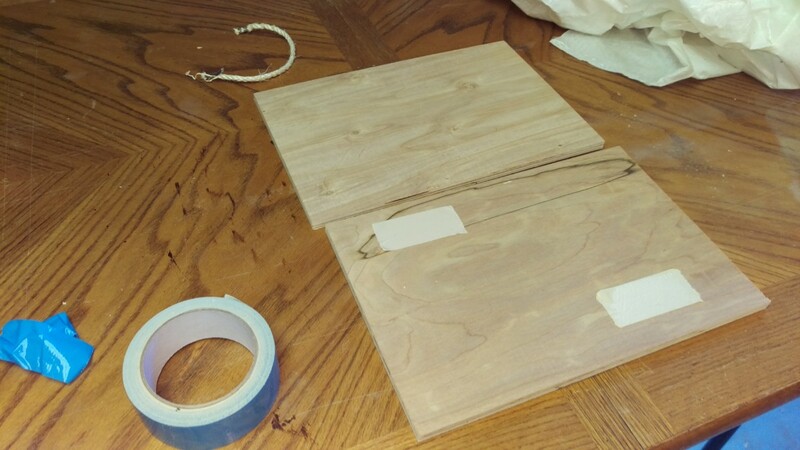 Also, the underlayment is only 5mm thick, so I ended up gluing two pieces to get two 10mm thick boards. 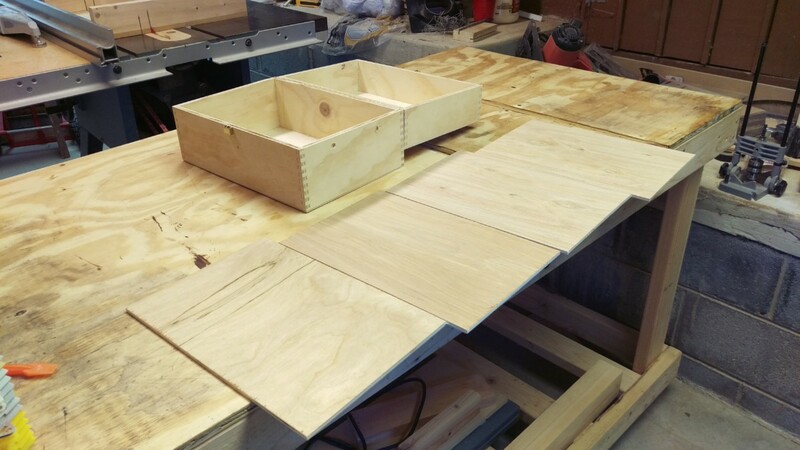 Shown are the 4 pieces I am going to glue together. They laminate together fairly easy. I was sure to glue them together before cutting them down to the actual size I needed, so that the edges would all be perfectly flush. 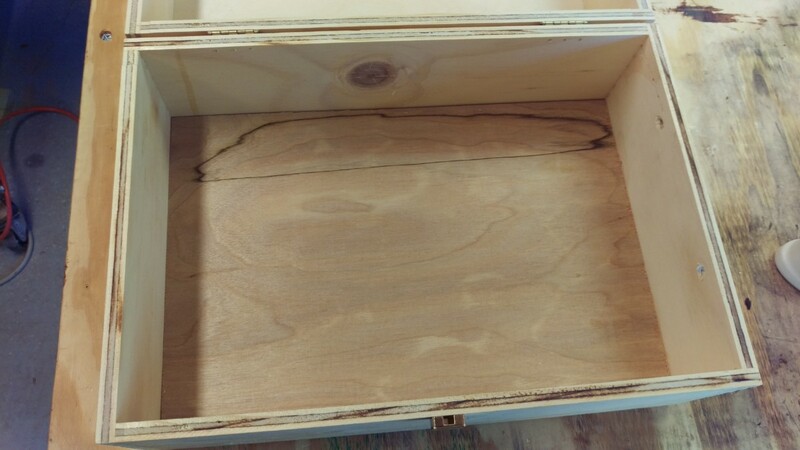 After cutting each piece, I test fit it inside of the box. I wanted it to have a snug fit, but not be so tight that it stuck. Just a hair under the inside dimensions of the box. At this point, I need to do a little bit of thinking. Based on the dimensions of the spool of thread, I figured that I could fit 35 spools per panel, for 70 total. 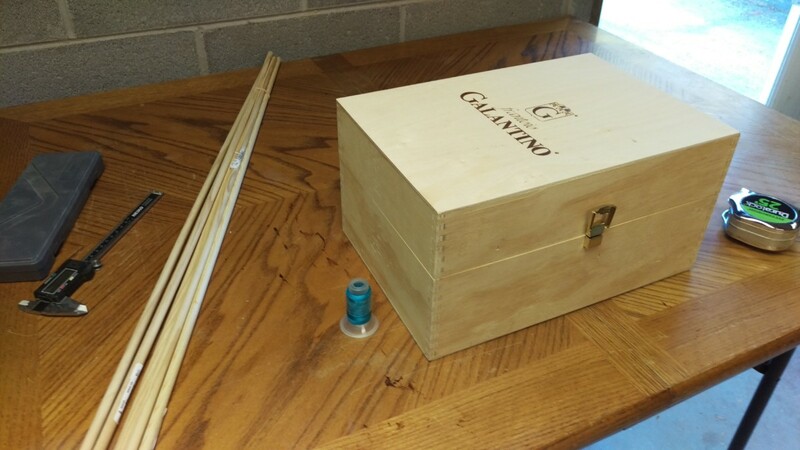 I also knew that the inside height of the box was more than twice the height of a spool. In other words, I could stack two panels in without a problem. 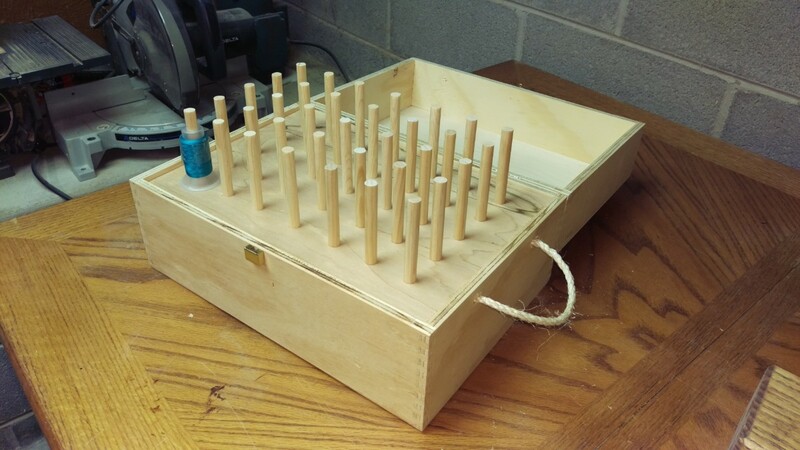 I decided to make each of the dowels just under half of the inside height of the box. 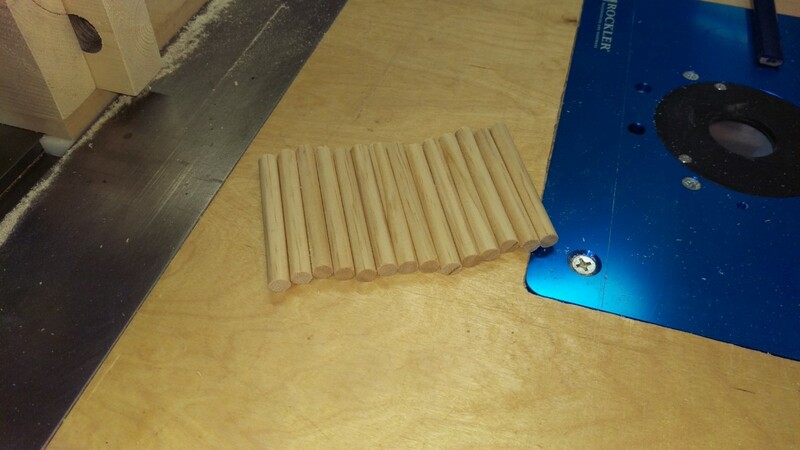 Thus, the next step is to cut the dowel rod down into equal-length pieces. 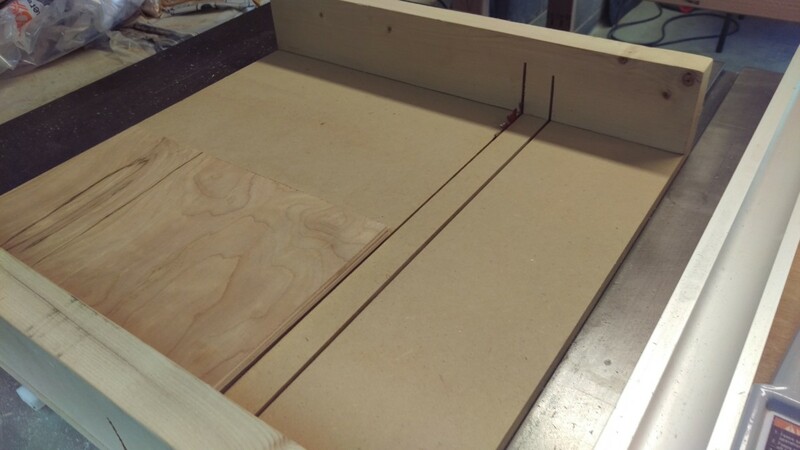 I set up a stop block on my crosscut sled and used the table saw to cut my dowel rod down to pieces. 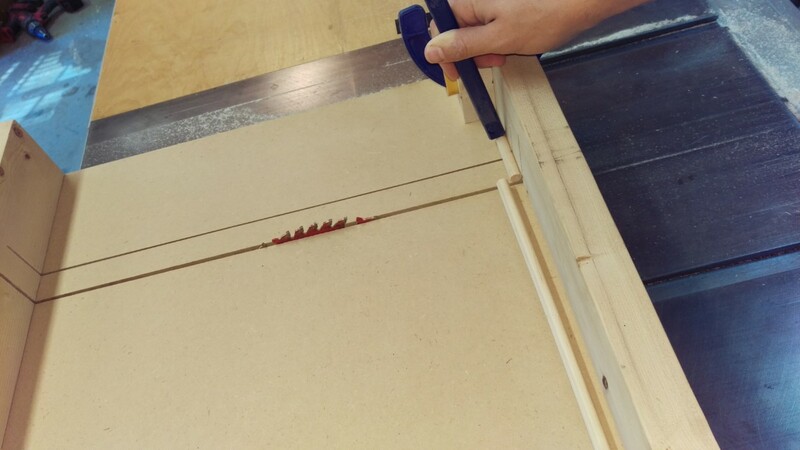 It’s important to use a pencil or something to hold the small piece of dowel rod in place, otherwise it can catch in the table saw and shoot off. I don’t consider this much risk if both pieces are securely held, but a good bandsaw could also perform this operation, with less fear of turning the dowels into projectiles. 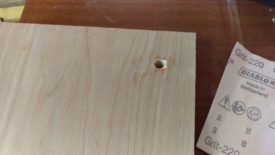 Now I needed to drill the 35 holes per panel for my dowels. I started by making an even grid, where each X will be a hole. I spaced them as evenly as possible. 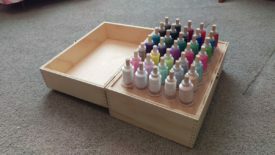 The size of the box didn’t quite divide evenly, but I did space them symmetrically, so it still looks nice. Once I had my lines drawn on one panel, I simply used double-stick tape to tape the two panels together. 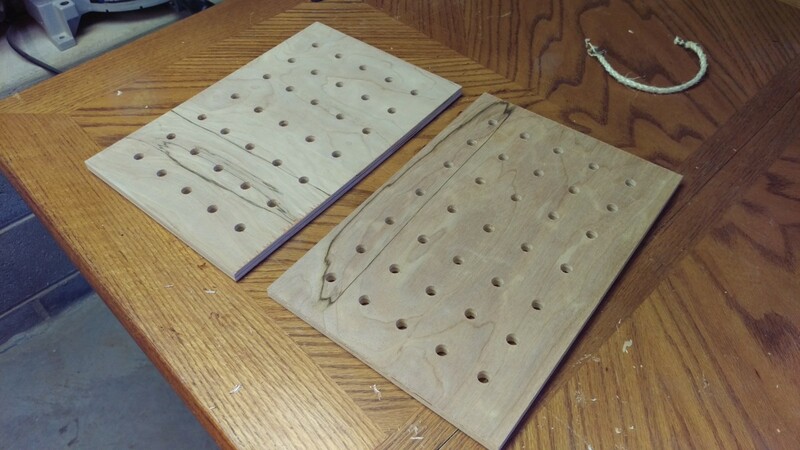 This let me drill out both panels at once, and ensure the spacing would be identical between them. I used my drill press to make the holes. 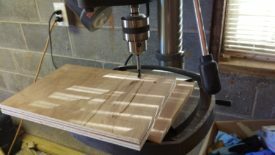 This let me make sure I was drilling straight holes, and I found it to be faster. You could certainly do this job with a hand drill as well. In retrospect, I said I shouldn’t have cheaped out and gone with cheap underlayment. It tears really easily and is awful stuff. 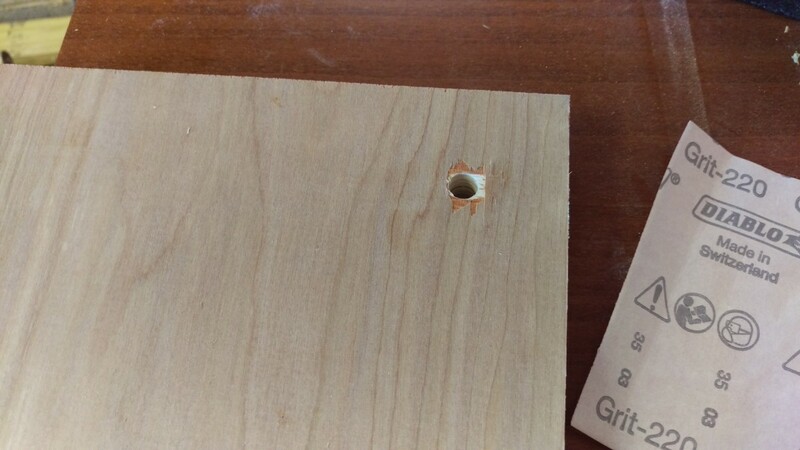 I initially started drilling without a backer board, and the bottom tore out really severely, as shown. After that, I had a piece of scrap under the panels for the remaining holes, which helped considerably. Fortunately, I was able to simply put any tearout on the bottom and hide it. The resulting panels came out fairly nice, I think. 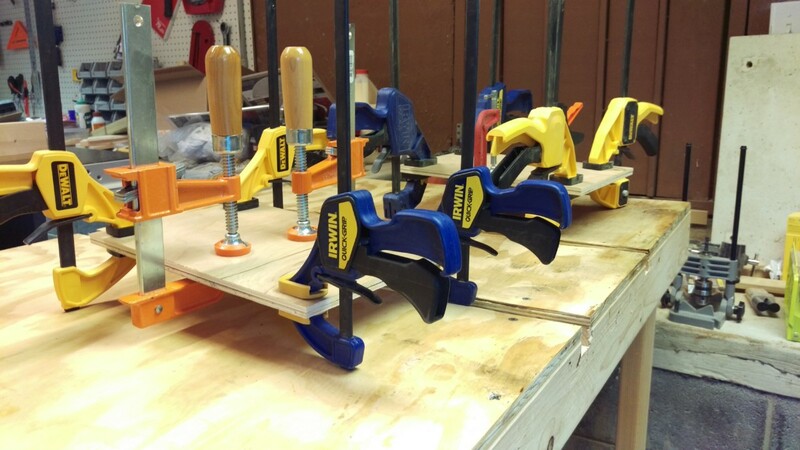 I was planning to glue the dowels in place, but I realized there’s not exactly a lot of load on them, and they were a fairly tight fit. 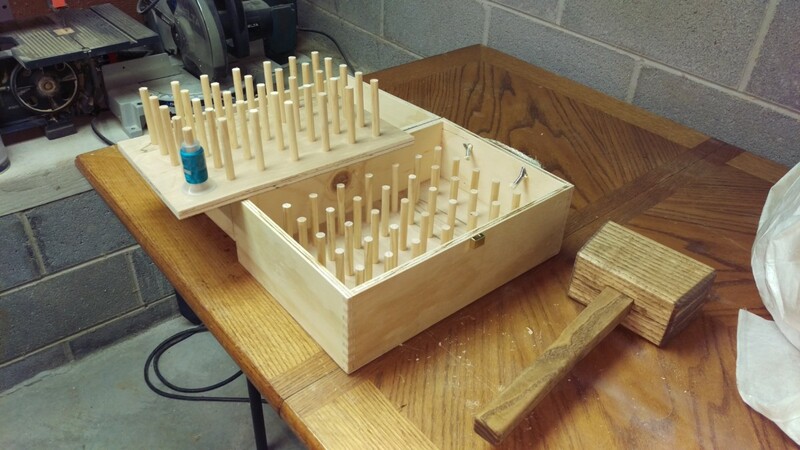 I ended up just seating the dowels in the holes without any glue. 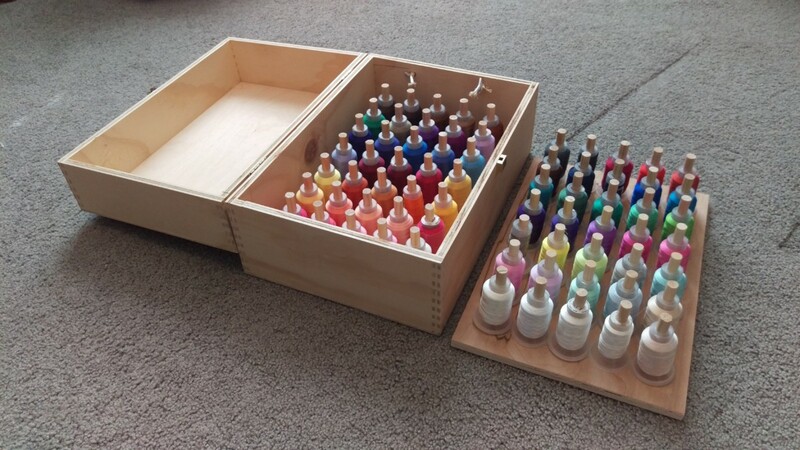 If my wife has any problems with that, I can always glue them later. One thing I was happy about that happened purely by luck is that the top panel nests right at the top of the box. It looks like I planned it that way, which I didn’t. And finally, you can see the end result. 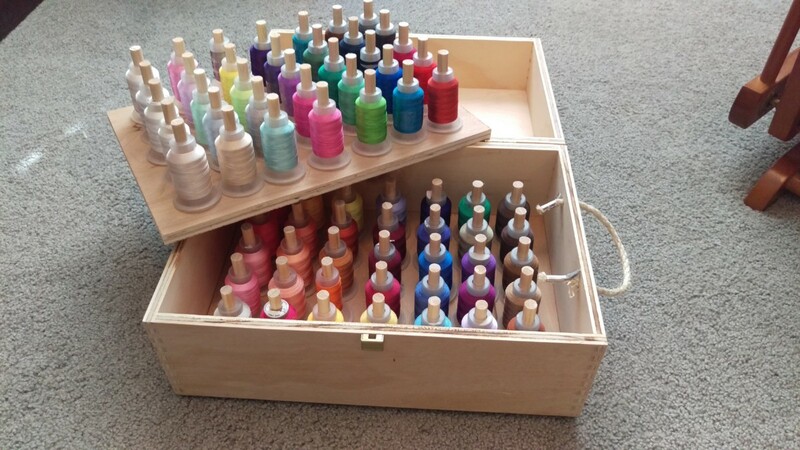 This was an extremely short and simple project, but we were able to get a nice 70-spool thread holder for my wife for about $10, rather than shelling out $50+ for a smaller plastic one. All in all, I think it came together rather nicely.